A quiet town, Cayucos invites folks to slow down, smell the ocean air, pick up sand dollars and never take life for granted. 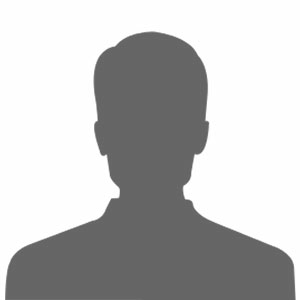 5 Bedroom – 3 Bathroom house in Cayucos, California. Prime Location on Pacific Avenue, just a few blocks from downtown. This Central Coast home at the beach is only steps from the beach access, has a fully enclosed wrap around deck, a large great room, Very spacious, modern comfortable, spotlessly clean, private, and relaxing. Sleeps 12. Our Great room is equipped with comfortable furnishings for your vacation, two large tables for big family dinners or get together, a well-equipped kitchen, 32” televisin with cable, VDV player and multiple music channels. 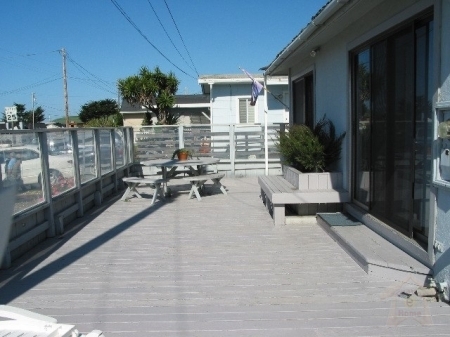 Enjoy the ocean view form the wrap around enclosed wood deck. The deck offers a spacious, comfortable place for gathering, in a private outdoor setting. Perfect place to meet for lunch, or enjoy dinner, after a busy day. 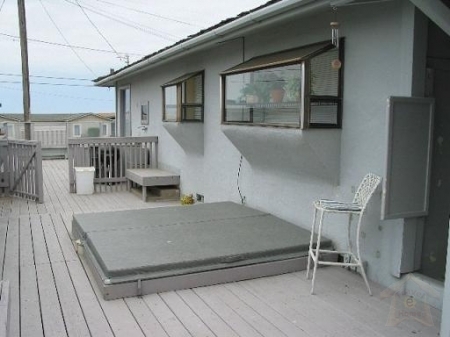 Hot Tub, Outdoor shower, and Sauna are available amenities to add to Central Coast location. We have 5 bedrooms. Three of the bedrooms have queen size beds, one has a king size bed, and on has 2 sets of bunk beds and an additional single bed. There are two bathrooms, on with a walk-in shower and the other with a tub/shower. There is also and outdoor shower and toilet conveniently located near the hot rub.